A serial killer had been living right under the village of Saint-Ferninand’s nose for years. The culprit was a surprise, and when the remains were finally discovered, the scene was gruesome and strange. But there is a bigger darkness underneath that horrific find, and the town knows all about it. It might be the worst kept secret in the village. When Venus, a teenager and the “weird girl,” stumbles across the “god” that is kept contained by “eyes,” she is unable to make a decision about it. 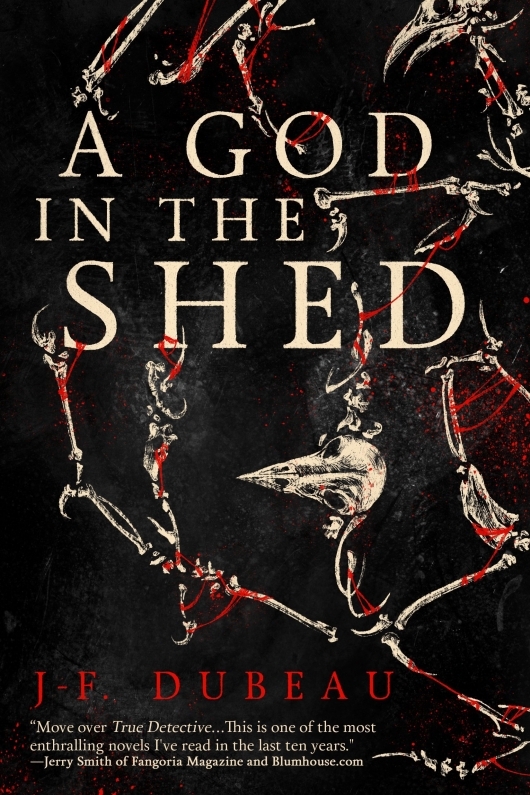 And when more people start dying in the most gruesome way possible, she gathers some grieving friends to do something about The God In The Shed by J-F. Dubeau. I really could not put the book down. Dubeau did a great job of keeping the reader guessing about who was good and who was not, and the factions behind the old orders in the town. The intricate mystery unfolds slowly, building up the tension and creepiness. The descriptions of the crime scenes as well as the monster’s artistic creations are “fleshed” out in almost too much detail, and I found myself looking away from the page as if it was onscreen. Although there are many characters (small town people are usually in everyone’s business), it is not too overwhelming, and each have layers – they are not all good or all evil. Even the serial killer is sympathetic. That takes talent. Gods and ghosts, possession and resurrection, death and strewn intestines – everything you want in a horror-mystery is in this novel. There is a setup for a second book, so I highly recommend you grab this one. The village of Saint-Ferdinand has all the trappings of a quiet life: farmhouses stretching from one main street, a small police precinct, a few diners and cafés, and a grocery store. Though if an out-of-towner stopped in, they would notice one unusual thing ― a cemetery far too large and much too full for such a small town, lined with the victims of the Saint-Ferdinand Killer, who has eluded police for nearly two decades. It’s not until after Inspector Stephen Crowley finally catches the killer that the town discovers even darker forces are at play. When a dark spirit reveals itself to Venus McKenzie, one of Saint-Ferdinand’s teenage residents, she learns that this creature’s power has a long history with her town ― and that the serial murders merely scratch the surface of a past burdened by evil secrets.